Ten all new tutorials plus all the newest Secrist dolls and products. A must have for anyone interested in reborning - hobbyist and professionals alike! 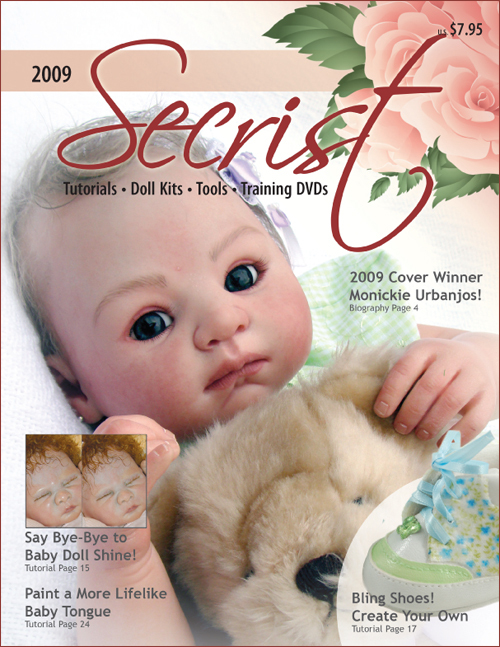 The Secrist Tutorial Catalog is the only one of its kind in the entire reborning industry. This catalog features 10 completely new tutorials for 2009. The 80 full color pages show you all the supplies we have for you to choose from and how they are used! Baby Shoes... Beyond Baby Bling! See doll kits in color, fully painted, or as blanks with no paint! At a price of just Euro € 4,95 our Tutorial Catalog is a must have for the beginner or the advanced reborner! Looking to purchase finished reborned dolls? See the advertisements in our new catalog for reborners who offer finished dolls for purchase.